As an Annapolis-area mom of two children under four, I have a few go-to places I always seek out when cabin fever sets in and I can’t stand looking at the spaghetti-hand prints on my kitchen walls for another minute. The first is obviously Target. The second is the Annapolis mall. The Westfield Annapolis mall has been around since the 80s, but over the past 10 years they have slowly transitioned the north eastern section of the mall into what I lovingly refer to as “Mom Mecca.” It is an entirely family-friendly space, complete with an aquatic-themed play place, enormous fish tank, fully equipped family bathrooms (complete with a lounge!? ), and a ride-along train that my three-year-old adores. They even have Kid Care, where you can pay $5 for a capable caregiver to watch your child for an hour while you try on dresses for that wedding you have to go to in two weeks. It’s a great space and a budget-friendly resource for parents looking for things to do with their kids, particularly on those cold, wintery days when the park just isn’t an option. 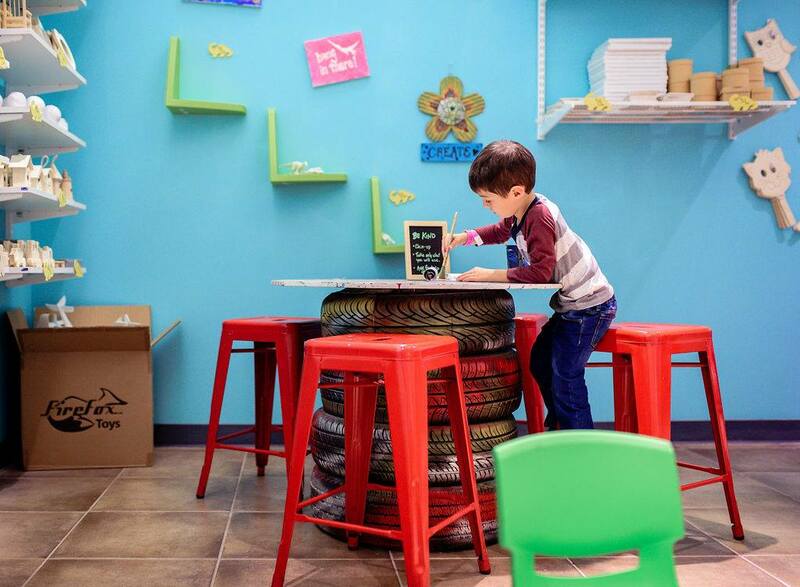 The newest addition to my beloved “Mom Mecca” is the Annapolis “Be With Me Children’s Playseum.” The Playseum opened in November of 2018 in Annapolis, with another existing location in Bethesda. 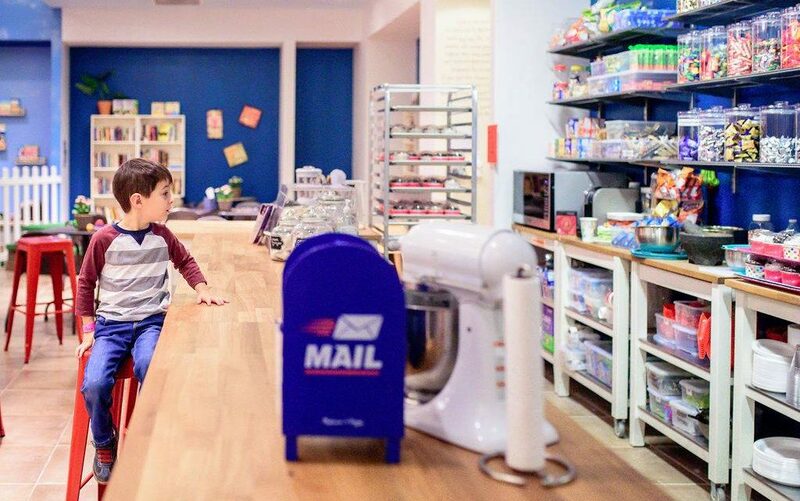 The Playseum bills themselves as a “Children’s Book and Toy Store in the design of a Kid-Size City,” and while there is a toy store to peruse as you check-in, the “store” felt more like a Discovery Zone or Storyville-type space. 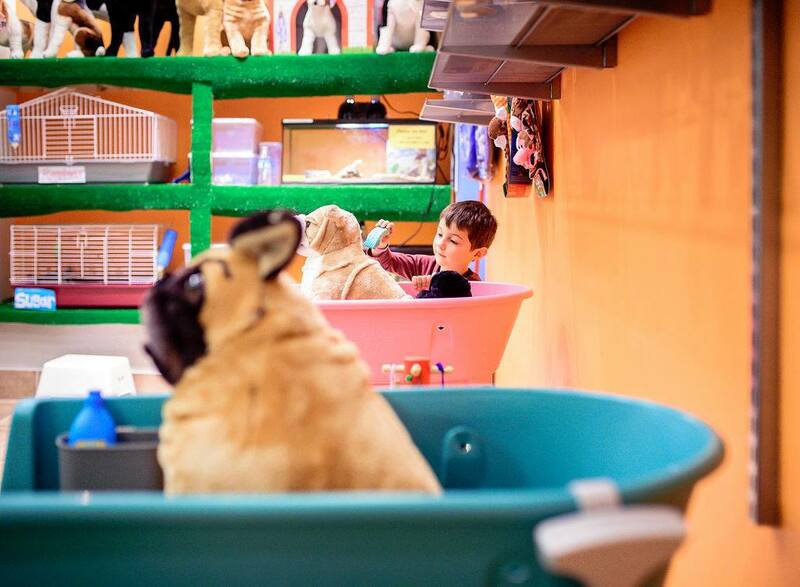 The Annapolis location boasts over 24 city-shops, which are small, themed spaces for you and your kids to play, many of which are pint-sized versions of beloved Annapolis staples (Great Harvest Bread Company, 91.5 SHINE Radio Station, Chevy’s, and more). 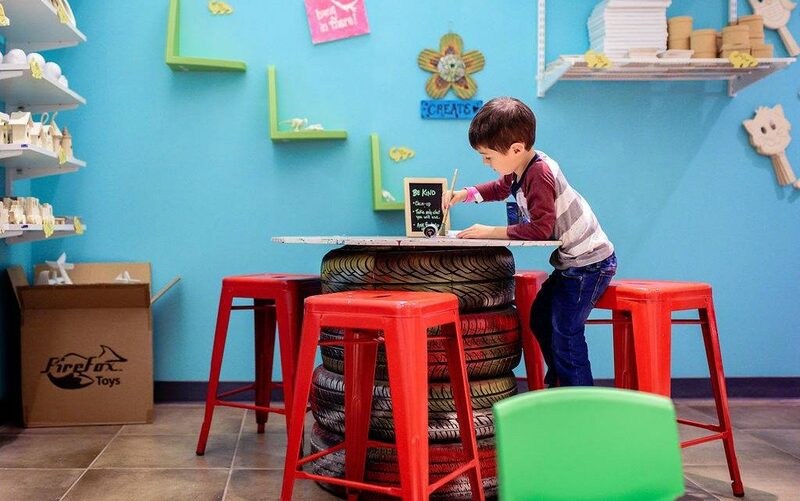 These rooms offer a variety of toys, activities, and costumes for kids and parents to play, free of screen time or technology. My family and I took our first trip to the Playseum this past Saturday. We arrived a little before 10am, coming straight from donuts and soccer practice, to find a small line of people awaiting entry. A quick note on pricing, the Playseum requires payment for ALL attendees (parents included). It is a flat $9.00 fee for everyone (babies, toddlers, teens, grandparents). So for a family of four, you are looking at $36.00 to go play. Everyone receives a wrist band after tickets are purchased and the wrist band is good for the full day, allowing families to leave and grab lunches and/or naps and then return for more fun. After entry there are an almost overwhelming number of options for kids. Some highlights for us were the pet shop with live animals (shout out to Raspberry the bunny! ), the Colonial Times Tavern where you can dress up in 17th century outfits, and the Labbe Family Orthodontics office where you can wield exceptionally large tooth brushes in a life-size dentist chair. We spent about an hour and half gleefully running from shop-to-shop, sometimes staying long enough to build a tower or pretend bake-a-cake, and sometimes rushing in and rushing out. 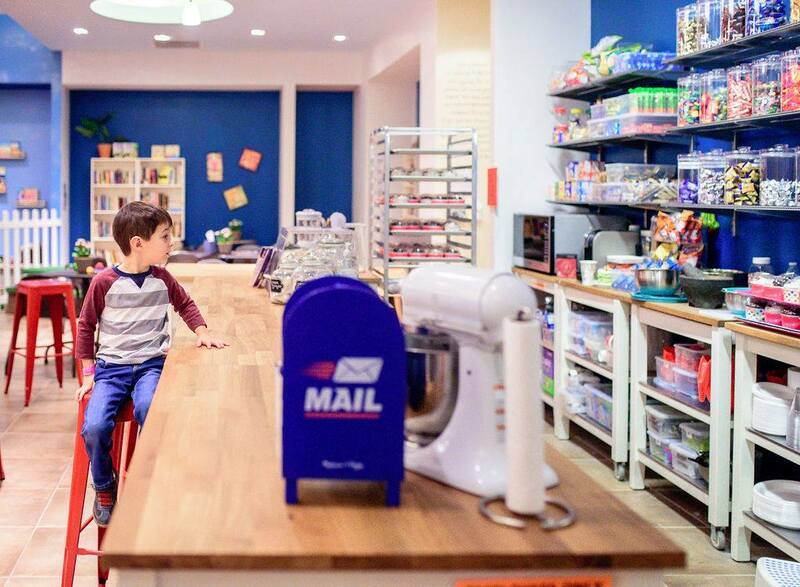 There are also add-on experiences you can purchase using Playseum dollars, including a Soap Bar, Science Bar, Art Room, and Bakery. For more information, you can check out the policies and pricing here. By the time we left, just before lunch, the Playseum was pretty crowded. 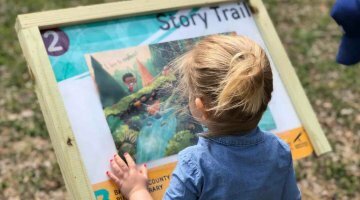 There were at least two birthday parties and a lot of families wanting a Saturday adventure, but the nice part of their set-up is that there are plenty of nooks and crannies to explore and get away from the crowd. Overall, it was a fun way to spend the morning. 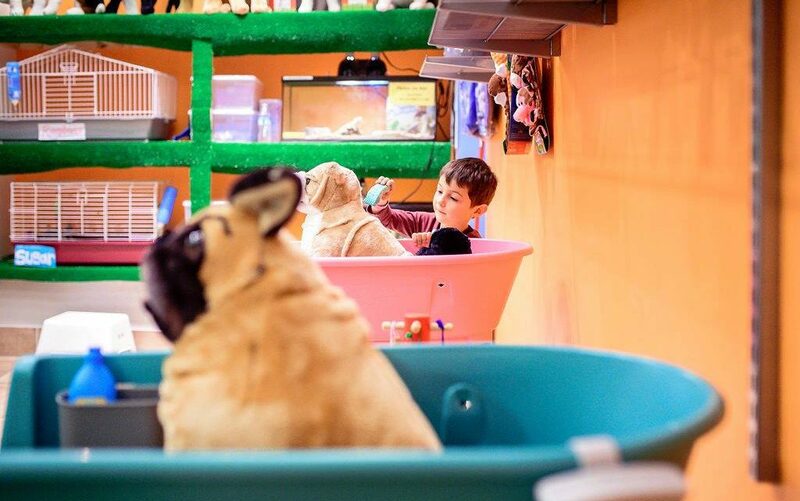 For the price tag, it felt more like a special-occasion place than a spot we would visit every week, but they do offer membership fees to ease the cost for families who want to come back again and again (inquire at the front desk for details). Next time we go we may aim for a sponsored night or possibly try to hit up a story time (11am, 2pm, and 5pm Monday-Saturdays and at 2pm and 5pm on Sundays). If the crowds are any indication, this spot is a hit with area families. If you are planning a trip, be sure to check out their Facebook page to get the secret code of the day and snag a free surprise when you get there! For more information, visit their website here and let us know what you think! Images courtesy of The Playseum’s Facebook Page. Previous Article Chatting with David Gonzalez, Creator of Aesop Bops!